The Curry 6 Fox Theatre is the new line off the Under Armour shoe range at the start of 2019. And a fine job they’ve done of creating basketball footwear that’s light, robust but also quite snazzy as well. Let’s start with the colouring, a tribute, UA say, to the Fox Theatre in downtown Oakland in a nod to the hometown from which the Golden State Warriors will take their leave next summer. 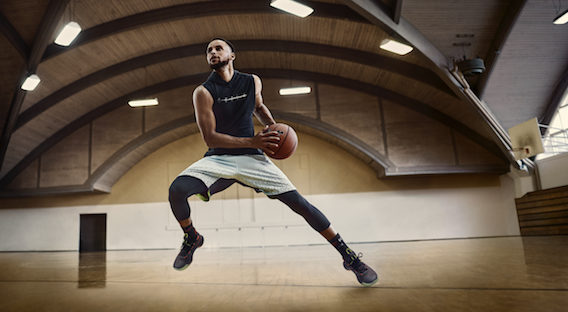 Like previous versions, the Curry 6 also features the full-length HOVR cushioning system and has been created with the NBA MVP’s court zipping in mind, facilitating rapid movement change. We tested them – and were pretty impressed. The lightweight feel is great, as is the heel counter which gives lots of stability and a sole which is made for speed. If you want a shoe that feels fun, this is a live option. You might not shoot like Steph but it’s a slice of Curry World.